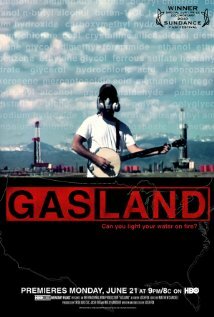 Gasland is a 2010 American documentary written and directed by Josh Fox. Nominated for an Academy Award for Best Documentary in 2011, the film focuses on communities in the United States affected by natural gas drilling and, specifically, a method of horizontal drilling into shale formations known as hydraulic fracturing. The film has reshaped public discourse and contributed to anti-fracking mobilizations.